Aero Precision brings another high quality product to the market with the introduction of their 7075 aluminum flip up front and rear sights. 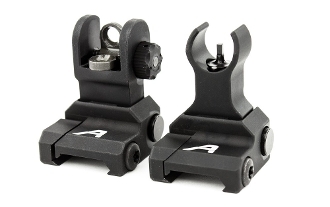 The Aero Precision AR15 Flip-Up Sight Set includes the AR15 Front Flip-Up Sight and the AR15 Rear Flip-Up Sight, both made with high-quality anodized 7075 aluminum. Whether using as your main sights or as back-up sights for another optic, you can count on the accuracy and durability this set offers. They are designed specifically for the AR15/M16 platform but will fit most 1913 Picatinny Rail sections. Height above rail (folded) - 0.6 in. Length (folded) - 2.29 in. Height above rail (folded) - 0.72 in. Length (folded) - 2.28 in.